I’m gonna make this real quick, for a few reasons. 1) It’s late and I really just want to get into bed. 2) I feel like I’ve been spending too much time writing about movies lately and not watching them. 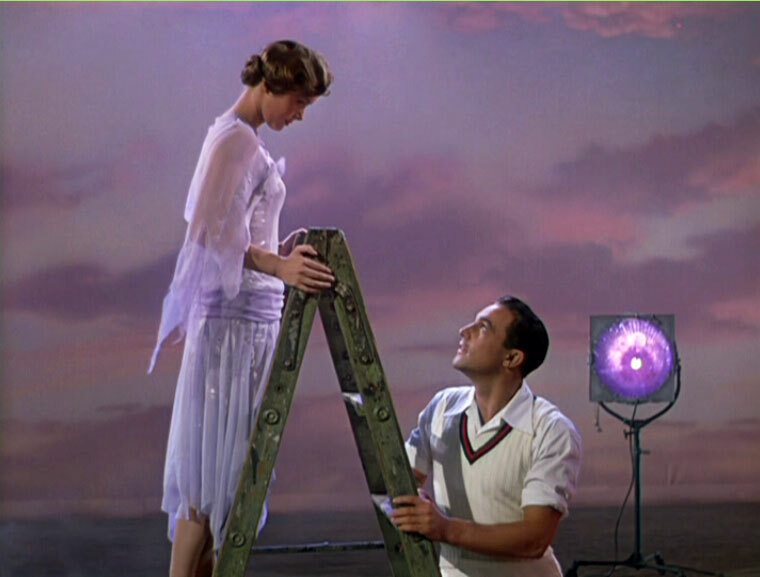 And 3) you probably already know Singin’ in the Rain and have your own feelings about it. I tend to be more verbose when I feel like I might be introducing something to an audience. There’s so much perfection in this movie… three absolutely charming lead performances (and a hilarious supporting by Jean Hagen), wonderful songs (it’ll be days before “Good Morning” gets out of my head), incredibly precision dancing made to look effortless, a fully engaging story, witty commentary on the relationship between truth and illusion in the movies (simultaneously satirizing and celebrating the machinations of Hollywood glamour), crisp dialogue, iconic scenes and gorgeous color photography. It’s a film you watch with a smile on your face. But there’s an elephant in the room. That “Broadway Melody” sequence. I’ve seen a good number of musicals in the nine years since my first viewing of the film and have a greater appreciation for the artistry and historical significance of this portion of the film. The individual portions of it are fantastic, and the “crazy veil” segment is one of the most impressive and breathtaking productions of all time. But it’s just too damn long for my tastes. As a whole, it doesn’t keep me rapt the way the lengthy song-and-dance climax of a Busby Berkeley film does. I’m not saying I hate “Broadway Melody”, there’s too much in it to love. But it’s definitely my least favorite part of the movie. This entry was posted on July 29, 2012 at 1:42 am	and is filed under Movie Reviews. You can follow any responses to this entry through the RSS 2.0 feed. You can leave a response, or trackback from your own site.